Benjamin Owen was born in 1787 in New Jersey, believed to have been the son of John and (?) Pool Owen. Benjamin's grandparents are known to have "emigrated from Wales in the early part of the eighteenth century, and located in New Jersey, where he married, and reared a family of children" said the 1893 Commemorative Biographical Record of Washington County, Pennsylvania. Benjamin's wife, Mary "Rebecca" Day, also was born in about 1787 in New Jersey. As young adults, the Owenses migrated to the wilds of southwestern Pennsylvania, making their home in Morris Township, Washington County. Their seven known offspring were Mary B. Owen, Aaron Owen, Benjamin Owen Jr., Elias Owens, Elizabeth "Betsy" Johnston, Emily Jennings, Levina Young and Rebecca Johnston. Census records show Benjamin Owen living in Morris Township in 1810, with two children in the household. That year, one of his neighbors was Daniel Johnston. As their daughter Elizabeth Owen was not born until 1816, back in New Jersey, this suggests that Benjamin and Mary Rebecca traveled to and from frequently in settling in the wilderness of their new home. Their whereabouts in 1820 are not yet known. The 1830 and 1840 censuses show the family in Morris Township, with three acults and three children in the household in 1830, and two children and three adults in 1840, with Aaron Owen living next door. Benjamin's health declined steeply in the spring of 1865, and he dictated a last will and testament on May 14, 1865. His wishes were that any household goods on hand at the time of his demise were to be equally divided between his wife and eldest, unmarried daughter Mary. Mary was to keep two cows and 10 or a dozen sheep. To his son Aaron, he bequeathed "all of my share of the farming utensils and all of the stock except what my daughter Mary takes and he is to pay all my Debts and funeral charges and everything." He then gave his 100-acre farm to Mary and Aaron to share equally, and the farm to his daughter Elizabeth Johnston where she was then living in Morris Township, Greene County. After a reasonable time for Aaron to complete payments to friend Ezekiel Braden, for a farm he had purchased, Aaron was to pay his sister Emily Jennings $300. Within a week or two, Benjamin had died, sometime by or before June 5, 1865. At the age of 83, in 1870, the widowed Mary Rebecca made her home with her son Aaron and his wife and eight children in Wind Ridge, Richhill Township, Greene County, PA, with her married children Emily and Benjamin living in next door homes. 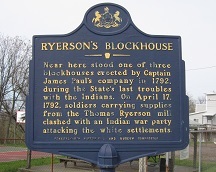 Just after the end of the American Revolutionary War, in 1792, Wind Ridge had been the site of a blockhouse constructed under the command of Capt. James Paul to protect local settlers agains Native Indian raids. On April 17, 1792, soldiers carrying supplies from the mill owned by Thomas Ryerson were attacked by a native war party in the area. Daughter Mary B. Owen (1810-1872) was born in 1810 in New Jersey and came to Morris Township as a girl. She never married, or learned to read and write, but lived at home with her parents her entire life, on a farm in Richhill Township, Greene County, PA.
At age 60 in 1870, census records show that she dwelled with her aged mother and brother Aaron together in Richhill.. In May 1871, her health declining, Mary wrote a will. Under its terms, her brother Aaron was to be reimbursed for "reasonable charges ... for trouble and labor borne and done by him on account of my sickness..." She also stated that Aaron was to inherit her 50-acre farm and related buildings as conveyed by their father, as well as her cows and sheep. Aaron also was to receive her two bedsteads and large dining table. She also bequeathed $200 each to her married sisters Elizabeth Johnston and Emily Jennings, to be paid in installments over three years, as well as the balance of her household goods, "to be divided by themselves as nearly equal as they can." Her brother Benjamin Owen Jr. and friend Stephen Winget witnessed the signing of the will. Mary passed into eternity in 1872 at the age of 62. Son Aaron Owen (1821-1888) was born in 1821 or 1827 in either New Jersey or in Washington County, PA. It is possible that he was a twin with his brother Elias. He may have been named for an uncle, Aaron Owen (1800- ? ), married to Mary (1801), both natives of New Jersey who also migrated to Morris Township, Washington County. Our Aaron was wedded twice, first to Maria Roberts (1829-1868) -- her maiden name also has been given as "Porter." They were the parents of Mary Elizabeth McKean, Rebecca Owen, Asa Owen, Emily Jennings "Emma" Dinsmore, Addison M. Owen, Albert Owen, Ezekiel "Braden" Owen and Maria Laura Louage. Sadly, Maria passed away on Aug. 2, 1868, at the age of 42 years, 7 months and 22 days, possibly in childbirth with their daughter Maria Laura. After a year or two as a widower, Aaron was wedded a second time to Mary McKean (1831- ? ), who was a decade younger. They produced a daughter, Sarah Jean "Jennie" Owen, born on Aug. 27, 1870. The Owenses appear together in the federal censuses of Richhill Township, Greene County, PA in 1870 and 1880. The family attended the Cumberland Presbyterian Church. Circa 1876, when the Atlas of Greene County, Pennsylvania was published by J.A. Caldwell, the map of Richhill Township showed a cluster of Owen family farms east of Crows Mills, and north of Durbin's Mill, bounded by the Dunkard Fork of Wheeling Creek, Stone Coal Run and Crabapple Creek. Aaron was named with a farm of 325 acres, with Samuel Jennings' farm of 113 acres to the southwest, Benjamin Owen's farm of 150 acres to the southeast, and John McKean's farm of 100 acres to the northeast. With his health failing in the summer of 1887, Aaron wrote a will. Friends Stephen Knight and Lindsey Gray were present and saw him sign the document. Aaron stated at the outset that he was "of sound mind and well disposing memory, and haveing a desire to settle my worldly affairs whilst I have a capacity to do so I make this my last will and testament...." He wrote that as long as she remained his widow, Mary was to inherit their home and all of his househood goods, and to keep two cows on the farm. He reserved that a bed and bedding should go to his son Braden ("Brady") and a setting for his daughter Jennie, as the other daughters had received before her. He also spelled out that his sons should share the balance of the estate but that they were to furnish their stepmother with "all necessary comforts of life such as provision & clothing & pay all her doctor bills & funeral expences & furnish her fuel and take good care of her in sickness & in health and furnish her feed & grass for her cows & a garden lot." He also stated that the sons should pay $500 each to their six sisters in installments over five years. Aaron passed away on May 19, 1888, at 11 a.m. His son Braden was present at the end. 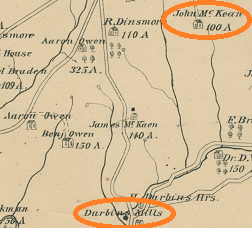 John and Mary Elizabeth McKean's farm north of Durbin's Mills, 1876. Mary lived for another nearly four years. she died at home near Durbin's Mill, Greene County on Jan. 23, 1892, having been brought low with la grippe and pneumonia. In an obituary, the Waynesburg Democrat said that the " remains were brought to this place Saturday. Funeral services were conducted by Revs. Swain and McGarvey at the C.P. Church, after which the body was conveyed to the Jacksonville cemetery, there to await the resurrection morn." Daughter Mary Elizabeth Owen (1849-1923) was born on Aug. 5, 1849 in Morris Township, Washington County. On Oct. 22, 2868, in a ceremony led by Rev. Stephen Wingett in the home of Samuel Jennings in Prosperity, Washington County, she was wedded to Civil War veteran and farmer John McKean (Aug. 22, 1839-1920). 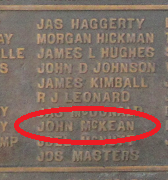 John was the son of James and Jane (Leech) McKean, the father having emigrated from Ireland. John stood 6 feet tall, with a fair complexion, brown eyes and dark hair. They produced nine known children -- Aaron Owen McKean, Olivia May McKean, John Iams McKean, Rebecca Abigail McKean, Mary Elizabeth McKean, Margaret Linnie McKean, Braden Lantz "Brady" McKean, Albert Addison McKean and Emma Orpha McKean. John once wrote that "I cast my first Vote for Abriham Lincoln in the faul of his first running for president the first time." On Sept. 18, 1862, at Jacktown/Wind Ridge, Greene County, John enlisted in the Union Army and was assigned to serve in the 18th Pennsylvania Cavalry, Company C, commanded by Capt. Frederick Zanacher. Early in his military tenure, Henry and the 18th Cavalry were stationed in the vicinity of the District of Columbia, defending the city against possible enemy invasion. He was captured twice during the war, the first time on or about Feb. 28, 1863. He was exchanged in Loudoun County, VA and sent to Parole Camp in Banks, VA. During Gen. Robert E. Lee's invasion of Pennsylvania, the 18th Cavalry traveled from Culpeper Court House toward Washington DC and then toward Pennsylvania, with John contracting hemorrhoids. He and the 18th saw action at Hanover (June 30, 1863) and Gettysburg (July 2, 1863). The Gettysburg fight took place at the very southern tip of the battlefield near Big Round Top. The 18th was part of what scholars have called a "suicidal attack" led by Gen. Elon Farnsworth. Under heavy fire, the 18th retreated, and John was spared injury. Then on July 7, 1873, he was taken prisoner at Hagerstown, MD. He moved with the Confederate army until he reached the prison camp at Belle Isle in Richmond at the end of July. He remained there and contracted typhoid fever and pneumonia. Along with other sick POWs, he was paroled/exchanged in August 1863, and was sent via a steamer to Annapolis, MD. A friend saw him at Annapolis and noted that John "was greatly emaciated and I did not expect to see him again for I thought he could not survive." He was treated in Annapolis for several months and in November 1863 was ordered to an army hospital in West Philadelphia, remaining there until February 1864. Later, the 18th was involved at Brandy Station, Germania Ford (May 4, 1864), Kilpatrick's Raid (Feb. 28, 1864), Spotsylvania, Yellow Tavern (May 11, 1864), White Oak Swamp and Winchester (Sept. 19, 1864). While in Winchester, the hemorrhoids flaired up and he showed them to the regimental surgeon. Boyhood friend Barney Hughes, of the 1st West Virginia Infantry, saw him at that time and noted that he was riding on his hip astride his horse. He received an honorable discharge on July 10, 1865 while in Cumberland, MD. 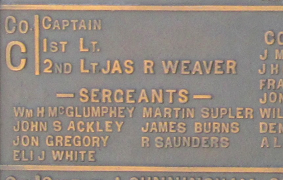 Above: John's name on the Pennsylvania Monument at Gettysburg. Below: the Gettysburg marker honoring the 18th Pennsylvania Cavalry at the southernmost tip of the battlefield. Grandson Aaron Owen McKean (1870-1938) was born on April 1, 1870 and was named for his maternal grandfather. He was joined in marriage with Lucy Rayle ( ? - ? ). They were farmers and made their home in the 1930s in Buffalo Township, Washington County, PA. Suffering from diabetes and a deadly case of influenza, he passed away at the age of 68 on Dec. 12, 1938. Burial was in Washington Cemetery. Stanley McKean of Claysville signed the official death certificate. Granddaughter Olivia May McKean (1871-1948) was born on Sept. 13, 1871. She grew up learning the seamstress skill. When she was 26 years of age, on Sept. 14, 1897, she was united in holy wedlock with 23-year-old Rev. Dr. E. Judson Headley (July 27, 1874-1930), son of George "Whitfield" and Phoebe (Milliken) Headley of Harveys, Greene County. Rev. James McCormick officiated at the nuptials held in West Finley. The couple bore two daughters, Daisy Stalker and Miriam Headley. Judson received his undergraduate and divinity degrees at Adrian College in Michigan. He is known to have performed the wedding of James "Arthur" Williams and Mary C. Coughanour in 1903, of the family of Margery Victoria (Rush) Williams. In 1907, he was involved with the Prohibition county convention in Washington. His churches over the years were in Youngstown, OH; and Uniontown and Turtle Creek, PA. Circa 1917, Judson was selected as pastor of Castle Shannon Methodist Protestant Church near Pittsburgh, which he served for the balance of his life. Sadly, while undergoing surgery on Dec. 14, 1930, he suffered a pulmonary embolism and died in Washington Hospital. Burial was in Allegheny Memorial Park Cemetery, with the funeral officiated by Rev. Dr. J.C. Broomfield and Rev. Dr. A.J. Allen, president of the Pittsburgh Conference of the Methodist Church. Olive survived her spouse by 18 years and made her home at 728 Roselawn Avenue in Mount Lebanon near Pittsburgh. She endured the death of her married daughter Daisy Stalker. On Aug. 12, 1948, she passed away. Grandson John Iams McKean (1873- ? ) was born on Aug. 6, 1873 (or 1874). Granddaughter Rebecca Abigail McKean (1875- ? ) was born on April 2, 1875. She was deceased by 1915. Again a sad message lays before us. The seal broken. We are made to realize that another loved one in our native state has been called away. Thus, one by one, are forming that happy throng, making Heaven more sweeter and our Saviour more precious.... [She] was one of God's choicest flowers, a favorite worker in his vinehard, and a favorite among her many friends. Granddaughter Margaret Linnie McKean (1879- ? ) was born on April 13, 1879 (or 1880). Grandson Braden Lantz "Brady" McKean (1881-1950) was born on Nov. 27, 1881 in Deep Valley, Greene County. He married (?). Over the years, Braden earned a living in the moving and storage business. They made their residence at 19 Laurel Avenue in Washington. At the age of 68, suffering from hypertension and prostate cancer, Braden was felled by a heart attack and died instantly on Sept. 22, 1950. His remains were placed into repose in Washington Cemetery. W. Addison McKean was the informant for the death certificate. Grandson Albert "Addison" McKean (1885-1951) was born on Jan. 17, 1885 in Deep Valley, Greene County. He wedded Pearl Lydia Headley (1885-1980). Addison was employed as a factory manager with a glass house in Washington, Washington County. Circa 1951, their home was at 182 Elm Street in Washington. Burdened with hardening of the arteries, Addison was stricken with a cerebral hemorrhage in 1950 and lingered for a year. He passed into eternity at home on Aug. 19, 1951, at the age of 66. Interment was in Washington Cemetery. Granddaughter Emma Orpha McKean (1889- ? ) was born on June 17, 1889 (or 1888). Daughter Rebecca Owen (1851-1923) was born in about 1851 in Morris Township, Washington County. She was joined in marriage with Joseph S. Carroll. The Carrolls produced a daughter and perhaps more -- Elizabeth M. "Lizzie" Carroll, born in 1878. Circa 1880, their home was next door to her parents' in Richhill Township, Greene County. When Rebecca's aunt Emily (Owen) Jennings died in 1899, Rebecca -- now living in Wetzel County, WV -- was named as an heir in the estate. Granddaughter Elizabeth M. "Lizzie" Carroll (1878- ? ) was born in or near Richhill Township, Greene County. Son Asa Owen (1853- ? ) was born in about 1853 in Morris Township, Washington County. 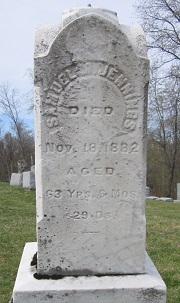 Daughter Emily Jennings "Emma" Owen (1856-1930) was born in about 1856. in Morris Township, Washington County, PA. She was wedded to Joseph Minton Dinsmore (Feb. 3, 1855-1930), the son of Henry and Lydia (McKeryan) Dinsmore of Greene County, PA. The couple produced three known children -- Owen S. Dinsmore, Louella Viola "Ella" Dinsmore and Bertha L. Dinsmore. Circa 1880, the young family lived on a farm in Aleppo Township, Greene County. They lived just a few houses away from the families of widower Thomas A. Hinerman and widow Melissa Ann (Hupp) Ullom. Their residence in 1899 was in Cameron, Marshall County, WV. By 1920, they had relocated into the city of Moundsville, Marshall County, where where Joseph earned a living as a furniture merchant. Their home was at 1010 Second Street. Joseph was burdened with senility and as he reached the age of 75 was having severe bouts of diarrhea. He succumbed on March 10, 1930. Interment was in Mount Rose Cemetery in Moundsville. Emily only survived her husband by eight months. Stricken with cancer of the uterus, she died at the age of 74 on Nov. 19, 1930 in Moundsville, Marshall County. Son Owen S. Dinsmore (1875- ? ) was born in about 1875 in Greene County, PA. Daughter Louella Viola "Ella" Dinsmore (1877-1946) was born on Aug. 22, 1877 (or 1880) in Greene County, PA. She never married and apparently spent her adult life living with her parents. In 1920, at the age of 43, she was employed in a Moundsville factory, making shirts for the Kleeson Company. After the deaths of both parents in 1930, she apparently moved to a new residence at 256 Jefferson Avenue in Moundsville. She suffered serious health ailments in her 60s, among them heart and kidney disease and hardening of the arteries. She died from their effect on the next-to-last day of 1946. Florence Koontz of Moundsville was the informant for the West Virginia certificate of death. Interment was in Mt. Rose Cemetery. Daughter Bertha L. Dinsmore (1878-1965) was born on March 3, 1878 in Greene County, PA. At the age of 21, on Nov. 8, 1898, she was joined in wedlock with 30-year-old Irish immigrant John O'Donnell of Pittsburgh. At the time, her home was in Cameron. The nuptials took place in a Cameron hotel, officiated by S.T. Montgomery. Bertha lived a long life and survived her husband. Her final years were spent at 260 Jefferson Avenue in Moundsville, Apartment 2. As her health failed due to leukemia, she was admitted to Reynolds Memorial Hospital in Glen Dale, where she expired at the age of 87 on Oct. 27, 1965. Her remains were laid to rest in Cameron Cemetery, with Ruth Graham of Moundsville serving as the informant for the death certificate. Daughter Victorene Owen (1858- ? ) was born in about 1858 in Morris Township, Washington County. She was united in holy matrimony with William Burt ( ? - ? ). Circa 1899, the Burts dwelled in Dallas, Marshall County, WV. Victorene is believed to have been deceased by 1938. Son Addison M. Owen (1863-1938) was born on July 1, 1863 in Richhill Township, Greene County, PA. On Dec. 1, 1882, when he was age 19, Addison was wedded to 19-year-old Mary Frances Parsons (May 27, 1863-1940), daughter of Spencer B. and Elizabeth (Grimes) Parsons. Their seven children were Charles B. Owen, Spencer A. Owen, Oscar Owen, Ava Ruth McCracken, Albert S. Owen, Lulu Owen and Earl R. Owen. The family dwelled for decades as farmers in Richhill Township, Greene County, with a postal address of West Finley. They were longtime members of the Wind Ridge Presbyterian Church. On Dec. 1, 1938, the couple celebrated their 55th wedding anniversary. But suffering from chronic heart disease for years, added to a deadly case of lobar pneumonia at the age of 75, Addison passed away three days after Christmas in 1938. His remains were placed at rest in the Wind Ridge Cemetery, and an obituary was published in the Waynesburg Democrat Messenger. Son Earl Ray Owen of West Finley was the informant on the official Pennsylvania certificate of death. Mary survived as his widow for only a little more than a year, afflicted with anemia, kidney disease and hardening of the arteries. She followed him to the grave on the second day of the new year in 1940. Grandson Charles B. Owen (1884- ? ) was born in December 1884. Circa 1938-1952, he made his home with his brother Spencer in Pittsburgh's Hazelwood section located 126 Hazelwood Avenue. Grandson Spencer A. Owen (1886-1952) was born on Oct. 6, 1886 in Greene County. He never married. He moved to Pittsburgh, where was a funeral director at the Fisher & Owen Funeral Home located at 126 Hazelwood Avenue, where he resided with his brother Charles. He was a member of the Hazelwood Presbyterian Church, the Joppa Lodge of the Masons, the Knights and Dames of Malta, Knights of Pythias, International Order of Odd Fellows, Modern Woodmen of American and the Allegheny County, Pennsylvania and National Funeral Directors Associations. At the age of 65, he was hospitalized in Pittsburgh's South Side Hospital, suffering from kidney and hypertension. Unable to recover, he was cut away by the Grim Reaper on June 10, 1952. Burial was in Wind Ridge Cemetery near the graves of his parents. A prominent obituary was published in the Pittsburgh Post-Gazette. Grandson Oscar E. Owen (1890- ? ) was born in April 1890. His home in 1938 was in Washington and in 1952 was in Claysville. Granddaughter Ava Ruth Owen (1892-1927) was born on April 2, 1892. She was wedded to (?) McCracken. 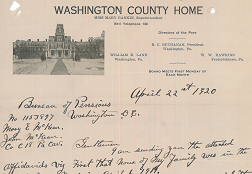 Their home was near the Pennsylvania/West Virginia state line, receiving their mail in Cameron, WV but residing in Aleppo Township, Greene County. Tragically, while expecting a baby at the age of 35, Ava Ruth was stricken with a n ectopic pregnancy, where the embryo was forming outside of her uterus, and added to a cerebral hemorrhage, she died on Nov. 25, 1927. Her remains were placed into eternal repose in Wind Ridge Cemetery, with Sellers McCracken serving as the informant for the death certificate. Grandson Albert S. Owen (1894- ? ) was born in November 1894. He resided in Dayton, OH in 1928-1952. Granddaughter Lulu V. Owen (1897- ? ) was born in September 1897. She was wedded to (?) Hamill. Circa 1938, their residence was in Prosperity, Washington County and by 1952, they dwelled in Bridgeville, PA.
Grandson Earl Ray Owen (1899- ? ) was born on Dec. 9, 1899. He married Margaret B. (Aug. 2, 1905-1985). They lived in West Finley, PA in 1938-1952, with Ray serving as informant for the death certificates of both of his parents. Ray died on Sept. 19, 1975. Interment was in Wind Ridge Cemetery. Margaret survived by a year and passed into eternity on Dec. 7, 1985. 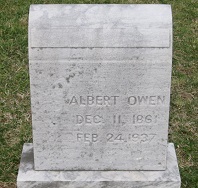 Son Albert Owen (1861-1937) was born on Dec. 11, 1861 in Morris Township, Washington County. At the age of 28, in 1900, he was still single and lived under the roof of his married brother Addison Owen in Richhill Township, Greene County. He was a lifelong farmer. At some point he married, and it's only known that he outlived his wife. Suffering from chronic heart ailments, he was admitted to Dixmont Hospital for the Insane in Kilbuck Township, near Pittsburgh. There, at the age of 76, Albert was taken in death on Feb. 24, 1937. His remains were lowered into eternal repose in Wind Ridge Cemetery. His nephew Spencer A. Owen, a funeral home director in Pittsburgh's Hazelwood neighborhood, signed the Pennsylvania death certificate. Son Ezekiel Braden "Brady" Owen (1865- ? ) was born on March 30, 1865 in Morris Township, Washington County. He was named after a family friend in Richhill Township. At the death of his father in 1888, Braden was named as an heir in the last will and testament and given the right to remain in the family homeplace as long as he desired. That same year, 1888, the 23-year-old Braden married Emma A. Jordan (Jan. 1865-1957). They were longtime farmers in Richhill Township, Greene County in 1900, receiving their mail at the Durbin post office. Their five known offspring were Lillian L. Shaffer, Wilma Aiken, Elsie Braddock, Stella M. Owen, Stanley E. Owen. The Owenses were faithful members of the Wind Ridge Presbyterian Church, where Brady served as an elder and a teacher in the men's Sunday School class. At the age of 72, on the fateful day of Sept. 6, 1936, despondent over ill health, Brady walked to a deep ravine about 1,000 feet from his home and placed a .22 caliber rifle against the center of his forehead and pulled the trigger, dying instantly. Son Stanley discovered the body. The county coroner ruled his death as suicide. Interment was in Wind Ridge Cemetery, following funeral services in the home and then at the family church. An obituary in the Waynesburg Democrat-Messenger referred to Brady as a "prominent farmer and stock raiser of West Finley" and that he "was one of the most widely-known men in western Greene County." Granddaughter Lillian L. Owen (1888- ? ) was born in December 1888. She was wedded to (?) Shaffer and in 1937 made her home in Grove City, PA.
Granddaughter Wilma Owen ( ? - ? ) was born in (?). She married (?) Aiken and lived in Canonsburg, Washington County circa 1937. Granddaughter Elsie Owen ( ? - ? ) was born in (?). She was united in holy matrimony with (?) Braddock. Their residence in 1937 was in Wind Ridge. Granddaughter Stella M. Owen (1890- ? ) was born in November 1890. She was unmarried and lived at home in 1937. Grandson Stanley E. Owen (1895- ? ) was born on Aug. 11, 1895 in Richhill Township. He suffered rheumatic fever at some point in his life, causing a lifetime of heart problems, and never married. In 1937, at age 42, he was single and lived with his parents in their farm home in West Finley, Richhill Township.. At the age of 61, on Feb. 11, 1957, he suffered from bleeding of the brain and died. Interment was in Wind Ridge Cemetery. Daughter Maria Laura Owen (1868-1942) was born on April 20, 1868 in Morris Township, Washington County. It's believed that her mother died in or after the childbirth. In about 1885, Maria married Frank Louage (April 1859- ? ), a native of New York and a farmer. The Louages resided on a farm in McConnell's Mills, Chartiers Township, Washington County circa 1899-1900. Their four known children were Mary V. Louage, George Louage, Jean Louage and Myrtle Louage plus one who died young. Their home in 1896 was in West Finley, Washington County. In February 1920, on behalf of her sister Mary McKean, Maria and Frank signed their names as witnesses to a declaration for a widow's Civil War pension. Maria outlived her husband. She spent her final years at 975 Allison Avenue in Washington, Washington County. She was named in the 1938 Waynesburg Democrat-Messenger obituary of her brother Addison. Toward the end of her life, she was senile and had arthritis, and when contracting bronchial pneumonia spiraled toward death. She passed on Feb. 9, 1942, at the age of 73. Mrs. Jean McCoy of Washington signed the death certificate. Burial was in Washington Cemetery. Granddaughter Mary Violet Louage (1887-1961) was born on Sept. 28, 1885 or in August 1887. She was joined in matrimony with Ralph O. Tate ( ? - ? ). She died in Washington on May 13, 1961. Grandson George Louage (1888- ? ) was born in September 1888. Granddaughter Jean Louage (1893- ? ) was born in September 1893. She married (?) McCoy. In 1942, her home was in Washington. Granddaughter Myrtle Louage (1898- ? ) was born in May 1898. Daughter Sarah "Jean" Owen (1870-1944) was born on Aug. 27, 1870. She was unmarried in 1892 at the time of the death of her mother. Jean eventually was wedded to William H. Hagerty Sr. (1864- ? ). The couple produced one known son, William H. Hagerty Jr. They resided in the Wind Ridge area for decades and were members of the Wind Ridge Presbyterian Church. In about 1934, Jean was admitted to the Curry Home near Waynesburg, and remained as a patient for a decade. She suffered from hardening of the arteries and died there after suffering a cerebral hemorrhage on Oct. 22, 1944, at the age of 74. Burial was in Oak Spring Cemetery in Washington County, with Mrs. Krause of 650 East Maiden Street in Washington signing the death certificate. An obituary was published in the Waynesburg Democrat. Grandson William H. Hagerty Jr. ( ? - ? ) made his home in Beaver, Beaver County, PA in 1944. Son Elias Owens (1821-1896) was born in about 1821 in either New Jersey or in Washington County, PA. (Sources differ.) It is believed that he was a twin with his brother Aaron. He married Sarah Auld (1824- ? ). One of her brothers was James Auld of Washington, PA. They were the parents of Caroline Owen, Margaret Owen, John Owen and Mary Ann Owen. One of the daughters married Frank Reese and lived in West Union. Their home in 1860-1870 was in Morris Township, Washington County, with Elias making a living as a farmer. In 1860, they dwelled within a short distance of Elias' parents and brothers Aaron and Benjamin Jr. and their families. At the age of 77, Elias contracted a fatal case of typhoid fever and succumbed on Sept. 8, 1896, at home near West Union, Morris Township. An obituary in the Waynesburg Democrat noted that he was survived by his wife and two adult daughters. Burial was in West Union Cemetery, following funeral services led by Rev. J.R. Morris. Daughter Caroline Owen (1844- ? ) was born in about 1844. She married (?) Robertson. In 1896, her home was in West Union, Washington County. Daughter Margaret Owen (1854- ? ) was born in about 1854 and grew up in Morris Township, Washington County. Son John Owen (1856- ? ) was born in about 1856 in or near Morris Township, Washington County. Daughter Emily Owen (1827-1898) was born in about 1827 in Washington County, PA.
She was joined in holy wedlock with Samuel M. Jennings (1819-1882). They spent their lives as farmers but did not reproduce. The federal census of 1870 shows the couple living in Richhill Township, Greene County, PA, with Emily's brother Benjamin Jr. and Aaron and their families next door. Circa 1876, when the Atlas of Greene County, Pennsylvania was published by J.A. Caldwell, the map of Richhill Township showed a cluster of Owen family farms east of Crows Mills, and north of Durbin's Mill, bounded by the Dunkard Fork of Wheeling Creek, Stone Coal Run and Crabapple Creek. Samuel's farm was shown as well as his brother-in-law Aaron Owen ( 325 acres), brother-in-law Benjamin Owen Jr. (150 acres) and nephew John McKean (100 acres). They were members of the Cumberland Presbyterian Church in Wind Ridge. The Waynesburg Democrat newspaper once said that she "was a noble christian character, having long been a member of the C.P. Church. Her life is worthy of example." Sadly, Aaron died on Nov. 18, 1882 at the age of 63 years, 6 months and 29 days. The cause of his early passing is not known. His remains were interred in the Wind Ridge Cemetery, with a large upright grave marker still standing circa 2015, when photographed by the founder of this website. As a widow, Emily and her widowed sister Elizabeth "Betsy" (or "Betty") Johnston made their home together. Circa the 1890s, she owned two town lots along Main Street in Jacksonville, Greene County. Emily passed away on July 15, 1892. An obituary in the Democrat noted that she had succumbed "after many weeks of patient suffering" and that "Rev. Cooper and Rev. Swain conducted the funeral services the day following in the presence of a large crowd. Her remains were interred in the Jacksonville cemetery." 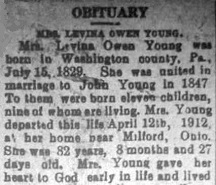 Daughter Levina Owen (1829-1912) was born on July 15, 1829 in Washington County, PA. When she was 18 years of age, in 1847, she was wedded to 30-year-old John Young (1817- ? ). The couple were 13 years apart in age. The Owenses went on to produce 11 children, among them Thomas Young, Mary Young, Rebecca Young, Aaron Young, Sidney Headley, Emaline Young, Elizabeth Young, Amanda Young, Silas Young, Clarissa "Clara" Young and Daisy Young. The federal censuses of 1860, 1870 and 1880 show the family residing on a farm in or near the small community of Nineveh, Morris Township, Greene County, PA.
Reported the Waynesburg Democrat newspaper, "Mrs. Young gave her heart to God early in life and lived a true christian; she was a living examle to her children and grandchildren, and a blessing to the community." John passed away sometime between 1880 and 1900. Circa 1896, at the death of her brother Elias, Levina was mentioned in the newspaper obituary. In 1900, the widowed Levina resided with her sons Thomas (divorced, age 51) and Silas (35) in Morris Township. At some point, she relocated to Milford, Miami Township, Clermont County, OH. She had suffered much, having been an invalid for more than twoyears, but God has wiped away all tears from her eyes. There is no more pain, neither is there to her anymore death, for she has proven Him to be conqueror over all and is resting in His presence, awaiting the coming of those who are yet on the way to the other shore. In her last illness she asked some one to sing "Rock of Ages," and as the old familiar hymn was sung, she was too weak to join in the singing but repeated the words as her face shone with the light of Heaven. She had hidden away with Him. As one who seemed to delight in speaking of God's goodness to her over and over she would say as the day was closing "When thou sittest upon thy throne, remember me, and as the faithful ones who watched by her side bended low to hear the faint whisper they would hear her say, "He will never forget me." She fell asleep in Jesus with the assurance that He would call her home, and that this body would be raised a spiritual body to dwell with Him forever. The remains were laid to rest by the side of her husband in Green Grove cemetery, there to await the resurrection morn. Son Thomas M. Young (1848-1931) was born on June 28, 1848. At the age of 22, in 1870, he was unmarried and lived at home, helping his father with farm chores. He eventually married but, unfortunately, was divorced by 1900. That year, census records show Thomas at age 51, living with his single brother Silas and their widowed mother in Morris Township. He became a retail grocer and worked in this field for many years, retiring in about 1921. In 1931, his home was at 117 Hall Avenue in Washington, Washington County, PA. At the age of 82, Thomas was felled by a stroke of apoplexy, and when added to pneumonia, he died on April 3, 1931. Burial was in Washington Cemetery, with Alberta Depoe providing key details for the death certificate. Daughter Mary Young (1850- ? ) was born in about 1850. Daughter Rebecca Young (1851-1923) was born on May 16, 1851. She was joined in holy matrimony with John McGinnis ( ? - ? ). In the early 1920s, following John's demise, Rebecca made her home in Milford, Miami Township, Clermont County. OH, and was supported by her late husband's pension. On June 1, 1923, already burdened with hardening of the arteries and senility, she suffered a stroke and lingered for two months until death finally enveloped her. She died on July 31, 1923, at the age of 72. Interment was in Milford. Son Aaron Young (1854- ? ) was born in about 1854. It is possible that his full name was "Aaron Owen Young" -- that he moved to Milford, Clermont County, OH in about 1906 -- and that at some point prior to 1906, he and a brother relocated to Alberta, Canada, where they renounced their American allegiance and became Canadian citizens. Reported the Cincinnati Enquirer on Feb. 12, 1911: "Now the question is, since they have been absent from Canada for five years, hence probably canceling their citizenship to that country, if they desire to become citizens of this country again from whom are they to forswear allegiance?" This case of identity needs to be confirmed. Daughter Emaline Young (1857- ? ) was born in about 1857. Daughter Elizabeth Young (1860- ? ) was born in about April 1860 in Morris Township, Greene County. Daughter Amanda Young (1862- ? ) was born in about 1862 in Morris Township, Greene County. Son Silas Young (1864- ? ) was born in about 1864 in Morris Township, Greene County. At age 35, unmarried, he lived with his divorced brother Thomas and widowed mother in Morris Township. Daughter Clarissa "Clara" Young (1867- ? ) was born in about 1867 in Morris Township, Greene County. On March 26, 1892, when she was 24 years of age, she was joined in matrimony with 24-year-old Gilbert L. Headley (1867- ? ), son of Cephas and Elizabeth Headley. The nuptials were performed by Rev. William Wallace at Hookstown, Washington County, PA. At the time of marriage, Gilbert was employed as a merchant in Richhill Township. Daughter Daisy Young (1873- ? ) was born in about 1873 in Morris Township, Greene County. At some point she relocated to Ohio. Unmarried in 1912, she and her mother dwelled in Milford, Miami Township, Clermont County. In 1923, still single and in Milford, she signed the death certificate of her sister Rebecca McGinnis. 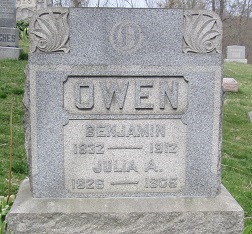 Son Benjamin Owen Jr. (1832-1912) was born on June 11, 1832 in Washington County. He married Julia (?) (1826-1905). Their four known children were John Owen, Hannah Owen, Mary Owen and James Owen. Circa 1860, federal census records show the family making its home in Morris Township, Washington County, living as neighbors to Benjamin's parents and brothers Elias and Aaron and their families. When the 1870 United States Census was enumerated, the Owens lived in Richhill Township, Greene County, PA, and employed 25-year-old Sarah Day as a servant in the household. Living in adjacent dwellings were his brother Aaron and sisters Emily Jennings and Elizabeth Johnston and their families. They remained in Richhill for decades. The Waynesburg Republican once noted that Benjamin "was for many years an elder in the Cumberland Presbyterian church and was highly respected." In May 1871, as his eldest sister Mary was in her last illness, and dictated a last will and testament, Benjamin witnessed her making her mark as a signature, as did friend Stephen Winget. Julia died in 1905. Benjamin survived her by seven years. Suffering from a blockage of the bowels, leading to deadly peritonitis, Benjamin Jr. passed awayat the age of 79 on Jan. 27, 1912. Burial was in the Jacksonville Cemetery. Daughter Mary, living in Wind Ridge, provided details for the death certificate, and erroneously gave her grandfather's name as "Aaron Owen" instead of "Benjamin Owen." An obituary in the Republican noted that his death had occurred "after an illness of two weeks." Son John Owen ( ? - ? ) made his home in Pittsburgh in 1912. Daughter Hannah Owen ( ? - ? ) appears to have been deceased by 1912. Daughter Mary Owen ( ? - ? ) was unmarried in 1912 and resided at home. Son James Owen ( ? - ? ) lived "in the west" in 1912, reported the Waynesburg Republican. Daughter Rebecca Owen ( ? - ? ) was born in (?). She was united in matrimony with (?) Johnston ( ? - ? ). They had one known son, William Johnston, who also may have gone by the name "Frank W." He made his home in 1899 in Albany County, WY. The fates of Rebecca and her husband are not yet known, but they may have died young, leading their son to be brought into the home of an uncle living in Wyoming. The son is believed to be the same "Frank W. Johnston" (1873- ? ) was born in 1873 Pennsylvania. He lived with his uncle Addison Johnston in Wyoming in 1900. He later moved to Colorado, settling in Garfield County, next-door to his uncles Add and Clay Johnston. Frank married Cora (?) Giddings in about 1907 -- it was his first marriage, and her second. The census of 1910 shows daughter Alice M. Johnston and Eunice V. Johnston in their household, along with eight-year-old stepson George "Kenneth" Giddings, who may later have been adopted and took the Johnston surname. The 1920 census of Garfield County, CO shows Frank and Cora and their six children -- Kenneth G. Johnston, Alice M. Johnston, Eunice Johnston, Mary Johnston, and twins Edith and Ethel Johnston. That year, Frank's occupation was farmer.